Scotsman Thomson travelled to the Far East in 1862 and spent the next decade touring Asia documenting his journey with photography. He spoke enough of the appropriate languages to communicate with his subjects and the results are beautiful and sensitive images of a foreign and yet familiar culture. 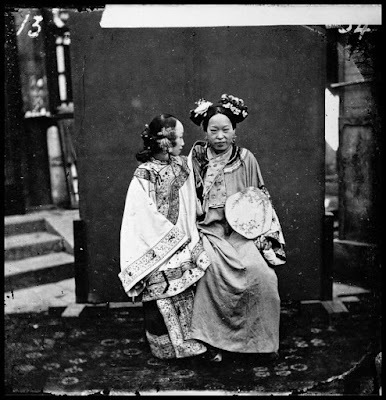 I particularly liked the photographs of brides, richly decorated and apprehensive, with their enormous headdresses and silk robes. 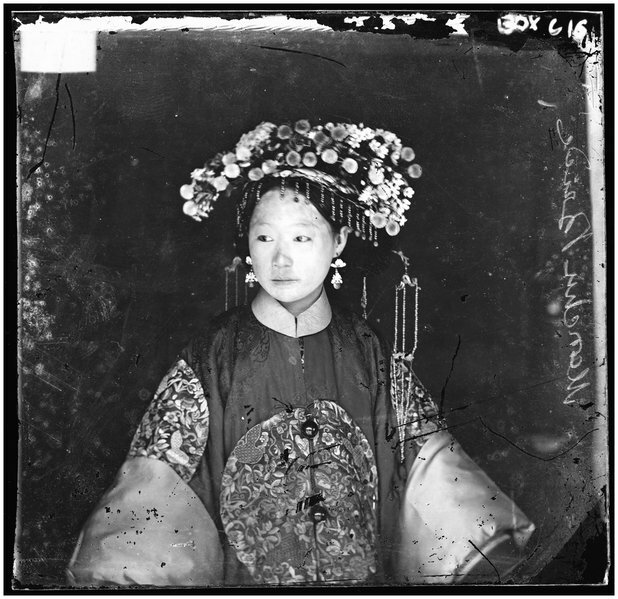 Thomson arrived in Hong Kong in 1868 and set up a studio there. 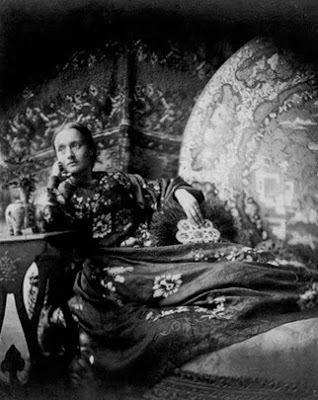 His reputation was sealed at home when he was commission to take photographs of Queen Victoria's son, Albert on his visit to the colony. 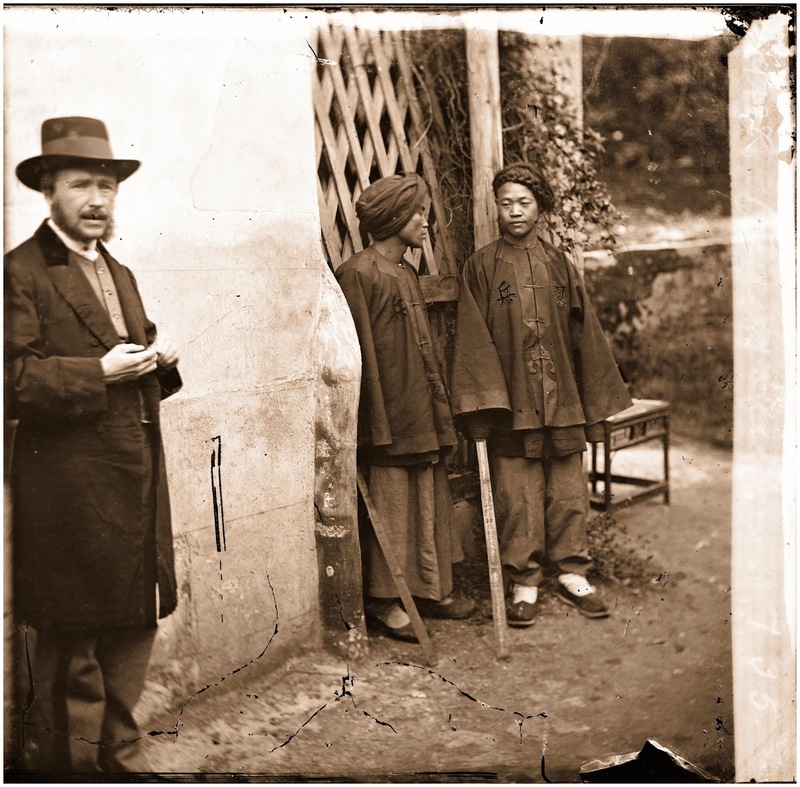 After Thomson's wife and son returned home in 1870 to avoid disease, Thomson ventured to more rural areas of China, where a white man and a camera were not exactly everyday sights, yet he was welcomed and allowed to do his work. We are even treated to a 'selfie' of Thomson, posing awkwardly near to soldiers, looking anxiously as his camera captures the image. 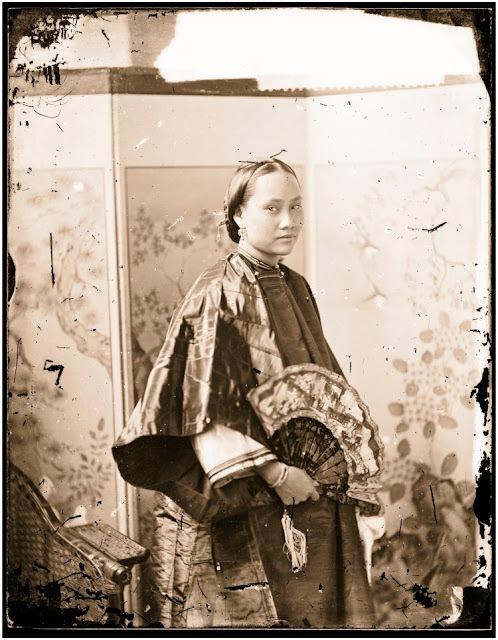 His images, crystal clear and big, show the beauty of uniforms, the intricate jewellery and silks of the women, and the furniture and accessories of the domestic interiors. The image above shows west meeting east and the contrast in their appearances. He wasn't a man who just marvelled at the beauty however. 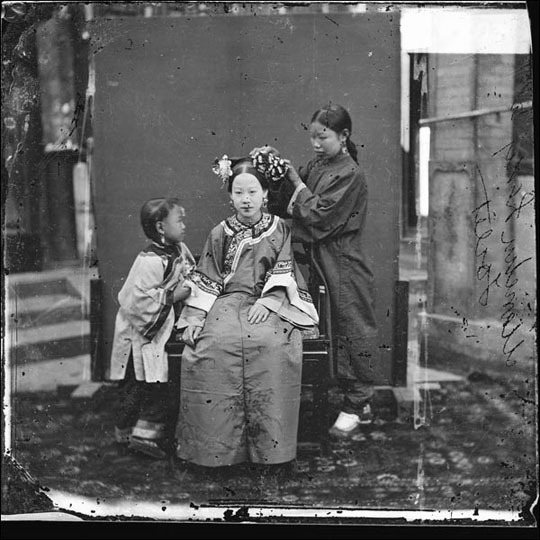 Through his images Thomson draws attention to the aspects of the culture of which he was critical. 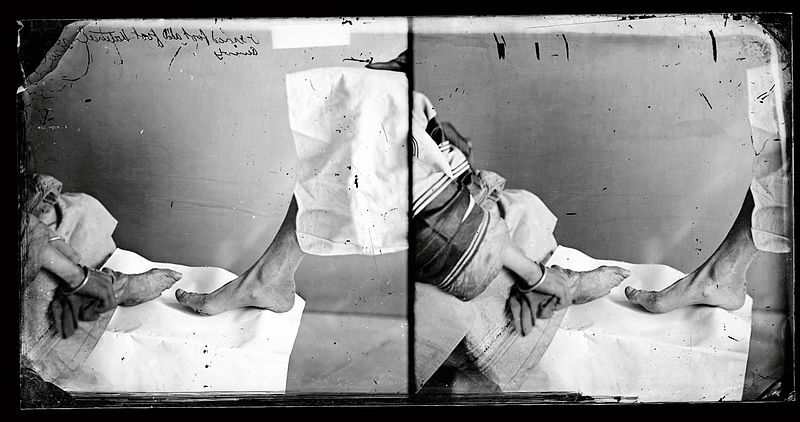 His powerful image of the bound feet of a woman of status as opposed to her unbound, poorer contemporary makes a horrifying display and showed how something could be seen as beautiful to one culture seems cruel to another. Mind you, at this point we were squashing women into corsets that were so tight that their organs moved so we're not exactly ones to talk. Interestingly the anti-foot binding movement seems to have gathered pace at the same time as the 'rational dress' movements in the west, so we aren't that different over all. Thomson also voiced his sympathies with the brides he photographed, likening their lives to slavery, beaten by husbands and mothers-in-law if she did not perform her duties. The brides often look quite wistful and apprehensive as they are decorated, but Thomson captures both the beauty and the fear. One thing I really loved seeing was 'outside the frame'. Obviously the images were made to be seen in a frame, close to the subject, but seeing the entire image shows you the background board and beyond, how the figures sat in their open-air studio regarding the strange Scotsman and his camera with interest. The likes of you will no doubt do as I did and see the parallels, conscious and otherwise, between Thomson's photographs and the fashion in art back in Britain. 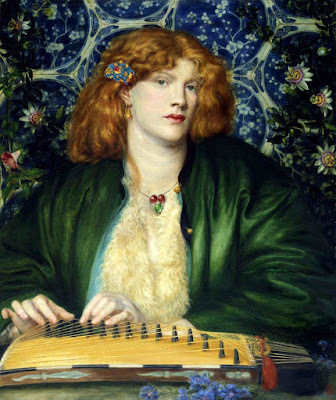 Cameron's image of her daughter-in-law (above) definitely came to mind (I wonder if she saw any of her contemporary's works?) and Rossetti's love of the East brings colour to the silks and jewellery, however I do encourage you to go and see the authentic and thought-provoking images of the Far East in this exhibition, which have been displayed alongside pieces from the Russell-Cotes collection. Merton and Annie Russell-Cotes were also travellers, visiting China around a decade later than Thomson and returning with keepsakes of their journey. As if you were in any doubt of how small a woman's foot can be bound to, there are tiny shoes on display alongside other objects from Shanghai and Beijing.